Marketing is different now. This is great news for smaller players like you and me. The old “spray and pray” model of marketing never fit well with us anyway — it was expensive and ineffective. There’s a good reason that traditional marketing often feels “icky” to small business owners, solo entrepreneurs, authors, and other creatives. When you are your brand, you don’t want to be seen as a self-promoter. You want to get closer to your customers, not repel them with pushy, aggressive tactics. Soft-touch marketing is the answer — not only does it feel better, but in light of today’s consumer behavior, it’s also more effective too. 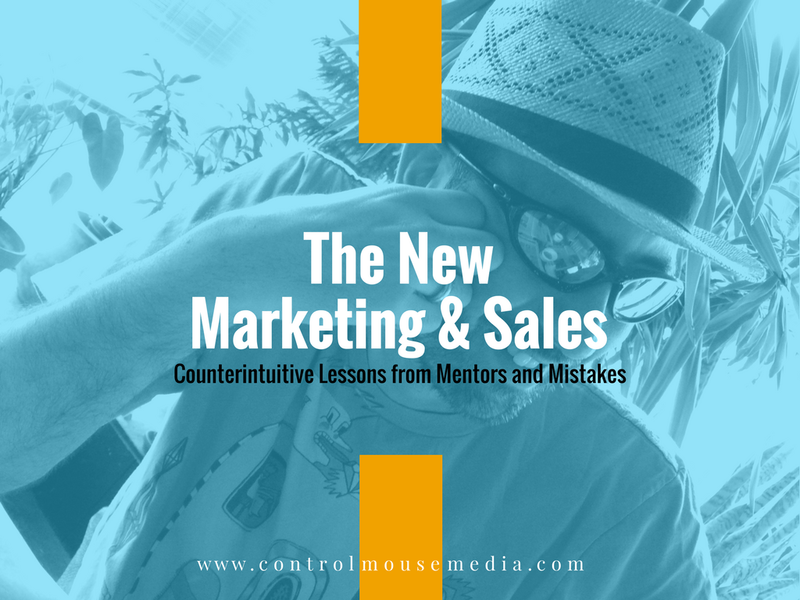 But it requires a mindset shift, and that we unlearn some of the conventional wisdom about marketing. For instance, the fact that marketing is no longer a campaign — it’s an ongoing set of relationship-building activities. If you look at marketing as an investment instead, today’s “spend” can continue to pay off years from now. But it’s going to take patience and some persistence. You’re going to have to get used to handing over some of the control to your customers, because those are the new rules now. Some of these notions are unconventional, but essential to succeeding in the new media landscape. Get comfortable with the counterintuitive, because sometimes it’s our only advantage against larger, more established players. I’ve learned a lot about this in my years at startups and running my own business, and I wanted to share with you the lessons that I’ve learned. So I produced a 16-part series of podcasts about the new way of doing things — what I call 21st Century Business Principles. Not everyone listens to podcasts, so I wanted to compile these episodes in one place for you. Let’s dive right in and talk about investing in the customer relationship. Marketing is more than just reaching people. The “reaching” part is easier than it’s ever been — and largely free now. Awareness about you or your brand is important, but you are throwing money away if you stop at the awareness phase. Marketing should not be a one-time spend to get a one-time result. If you think of it as an investment instead, today’s “spend” can continue to pay off years from now. It’s an investment in your content. It’s an investment in the customer relationship. Content: Every piece of content you create should be a reusable business asset. In order to make it efficient for you, you’ve got to go in with a plan built around clear goals. If you can see the outcomes, it makes it worth it to invest the time. Customers: The investment in customers is the best thing you can do for your business. But it’s not just about reaching customers so that they pay you. It’s about reaching them — and connecting with them — so that they create more customers for you. That’s content strategy — thinking long term, going in with a plan, and working towards converting your customers into advocates. Listen to the complete episode here: Marketing Is an Investment, Not a Cost. Or click here to read the show notes for the episode. Forging real connections with real customers take real effort. Every business owner knows this. So why do we behave differently when we get online? Why do we take social connections less seriously, and look for the tricks, hacks, or quick fixes? There are no shortcuts in building an audience, and you can’t rush or “hack” the trust-building process. But look at all the people out there buying backlinks to “help” with SEO, buying followers to pump their profiles, auto-DMs to attempt a quick conversion, and cross-platform auto-posting to save some time and effort. None of these “strategies” work, and in fact — they may even damage your business. Listen to this episode to learn why these tactics can backfire. Instead, we can ditch the tricks and seek efficiency with two big questions: 1) What can you optimize? and 2) What can you offload? Listen to the complete episode here: Stop Looking for Shortcuts. Or click here to read the show notes for the episode. Marketing starts with respect. Well, that’s the way it should be, anyway. That’s not what we see out there in the real world, is it? Armed with technology, everyone’s deploying their robots to interrupt us, shout at us, and steal our attention. Interruption after interruption after interruption. And then they expect us to actually like them? To trust them? To me, this is an opportunity. While others are aggressive and pushy and off-putting, what if you and I do our work differently instead? What if we stop shouting and start asking questions and solving real issues What if we use this “gift of opportunity” for forming connections and building trust? When you respect your audience enough to come to a decision on their own, it will be a stronger bond between you and your customer. This will pay off way beyond today’s sale. Still skeptical? Fair enough. Let’s address you skeptics out there, too. Listen to this episode and I’ll attempt to make my case. Listen to the complete episode here: Soft-Touch Marketing Is More Respectful — And More Effective. Or click here to read the show notes for the episode. Marketing is communication. It involves a lot of creativity, which is what I love about it — and the fact that if you’re a good writer, you have most of the skills you need to be good at content marketing. The other side of marketing is about data. It’s about measuring the effect of your efforts — in a controlled, unbiased way. The best marketers are the ones who see both sides of the equation — the art and science. This episode is about how you can adopt what I call an “experimental mindset” in your own marketing so that you can get better and better at it. I cover how having an experimental mindset can help you optimize your marketing activities — so you can spend more time on your business itself. Listen to the complete episode here: Marketing and the Experimental Mindset. Or click here to read the show notes for the episode. Social media alone won’t get you anywhere. If your plan is just to start “getting the word out there” by posting to Facebook or Twitter — stop now. The outcomes will never be worth the time you put into it. Prospective clients come to me all the time saying that they’ve “tried social — and it didn’t work.” Usually, this is because there was no plan behind it. Like anything else in business, it requires that you go in with more than just intent. You need set of objectives, a pathway to get there, and a way to measure your progress along the way. You’ll have content to pull from in creating social posts. You’ll create a next step in the customer’s journey. You’ll be building content as a business asset. These points alone make it worthwhile to stop and reassess your social strategy. This episode serves as a quick social media gut check. Listen to the complete episode here: Social Media Cannot Exist in a Vacuum — You Need a Content Strategy. Or click here to read the show notes for the episode. Marketing is nothing without a content strategy behind it. I produced this free online course to introduce you to the principles and practices of content strategy — using content to find and connect with an audience, build trust, and ultimately, earn paying customers. The course content is open to the public — you do not need to register. For writers and other artists: I have a comprehensive online course to teach you the elements of content strategy in a structured way. It’s modeled after the course that I teach at Emerson College. It consists of 42 video modules, with dozens of worksheets, templates, and guided assignments. The introductory lesson is open is you want to get a taste. Learn more about the course here. Here’s the complete list of current and upcoming courses I offer. Sign up to be notified of future courses! Originally published on July 24, 2018 on Control Mouse Media.